1. Automatically turn off in the sunlight. 2. Automatically turn on in the dark. 3. Automatically turn on at night even if you put it in the lamplight. Therefore: If you want to test the working effect of the light, please avoid the sunlight. Marine distress lights, emergency lights, safety light. This lights No expiration date, Easier to operate, Environmentally safe and no hazardous disposal issues. Power Source: 2Pcs D size batteries (not included). Battery life: Can last for about 600 hours. Waterproof: IP67, can float and stroke on the water. Long bulb Lifespan: 10,000 Hour. Visible distance: 10 miles on a dark, clear night. Strobe frequency: 50 times 1 minutes. Easy to Install: With the 3 holes on the product that you can attach it on any where you want. Does this distress lights US coast guard approve? Yes, US Coast Guard (USCG) request 1 nautical mile (1.9 km) visibility, and our light is super bright that visible up to 10 miles. Why there without on/off switch on the emergency lights? If there has the on/off switch, the waterproof performance will decline. 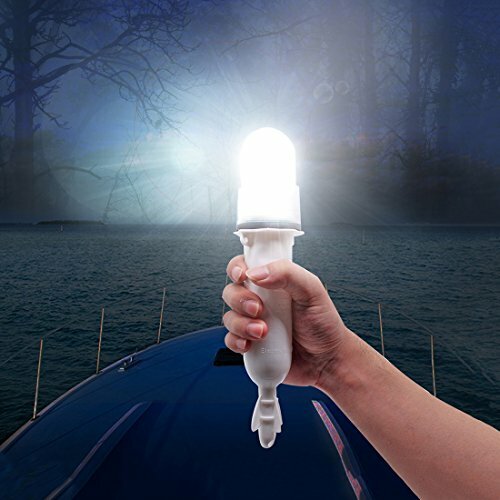 What's more, you can check other company's marine distress light on the Amazon market that all of them also doesn't have the on/off switch if their lights are IP67 waterproof. How to turn off the lights at night? 2. If you don't want take out the batteries, you just need to don't twist the lid completely, because lights will only work when you twist the lid completely. We are very confidence with our product, we Warranty for 1 year from date of purchase. 1 x Marine distress lights. ONE YEAR WARRANTY: Buy with confidence, our product provide One Year Warranty. If product have any problem, please feel free to contact our seller directly, we will spare no efforts to help you and make you satisfy. SUNLIGHT SENSING DESIGN: The light will turn off automatically during the day, and turn on automatically at night. Note: if you want to test the working effect of the light, please avoid the sunlight. APPLICATION: Marine distress lights, emergency lights, safety light. This lights No expiration date, Easier to operate, Environmentally safe and no hazardous disposal issues. What's more, the IP67 waterproof design will help you to abandon the ship In case of emergency. USCG APPROVE DISTRESS LIGHTS: This product provides 350 lumens of flashing strobe light and visible up 10 miles. Note: US Coast Guard (USCG) requirements of 1 nautical mile (1.9 km) visibility. EASY TO INSTALL: This led flash lights comes with 3 drawstring hole that supports you to hang it any place. No tool needed and easy fastening, which save the time and bring the convenience of installment. View More In Safety & Flotation Devices. If you have any questions about this product by Botepon, contact us by completing and submitting the form below. If you are looking for a specif part number, please include it with your message.